It’s not every week we host a professional baseball player at Dorie’s Promise. So imagine the excitement for our children when New York Yankee’s pitcher Ben Heller visited in December. We caught up with Ben a few weeks ago to follow up on his trip and plans heading into spring training. Ben’s connection to Dorie’s Promise started long before he and his wife, Martha, visited our home last December. In fact, they’ve been sponsors for more than four years. In 2011, a friend of the Hellers visited Guatemala and returned home on a mission to share about her trip and raise support for our children. Thankfully, Ben and Martha understood our needs and valued our desire to transform the lives of children. Although he had served on mission trips previously, Ben was surprised by the extremes of Guatemala. The natural beauty of the country and wealth in some Guatemala City neighborhoods is a stark contrast to the poverty in many villages and overwhelming conditions surrounding the Guatemala City landfill. Even our kids surprised him by how quickly they made him feel welcomed. 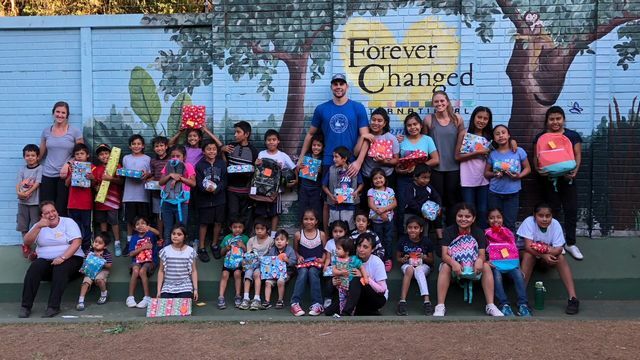 Baseball is a huge part of Ben’s life at home, but he didn’t want baseball to overshadow the reason he was working in Guatemala. He preferred to quietly join his wife and friend for a week serving at Dorie’s Promise without fanfare. As their trip grew closer, a Yankees fan from Guatemala reached out via Twitter and asked Ben to consider holding a baseball clinic in Guatemala City. Although soccer is definitely the favorite sport of Guatemalans, little league baseball has a steady fan base, with teams for children of all ages and tournaments throughout Latin America. As he considered the request, it became obvious that his baseball experience offered a unique opportunity for him to serve others during his trip. With the help of Guatemalan fans, Ben hosted a pitching clinic for 100 local players. As little league players honed their pitching skills, ours learned the game’s fundamentals. Thanks to Ben and local organizers, Dorie’s Promise received a generous donation from the players’ families. We are thankful for the opportunity to connect with local families. Most importantly, Ben shared his testimony with the children after the clinic, bringing together his story of faith, baseball, and service. Ben’s looking forward to sharing about his Guatemala trip with teammates and fans as spring training begins. Visiting our home has given him a new perspective on our work and the importance of our supporters. Ben stressed the importance of having a long-term commitment to Dorie’s Promise. He encourages others to become monthly sponsors, like he and his wife, and support our children as we transform their lives. After visiting our home, Ben understands the difference we make in the lives of children and sees the value in his sponsorship. We look forward to many more years partnering with the Hellers!